The Don shares more . . .
Hello again – The Don here guest blogging for Hopeforstrays. I got such a great response from my last guest blog post that I was asked to do another one. One of my Facebook friends suggested that I write about how being rescued impacted my life. My story started in London in 2010 when I was living in foster care with the RSPCA. I had been in care for some time due to my colour. Yes – can you believe it but black cats are harder to home!! Apparently some silly people are superstitious and think a black cat is bad luck!! Oh my cat how crazy! Especially as there are actually very few pure black cats – many like myself have a few white hairs or patches (I have a white “bikini” patch) so the whole superstitious thing is doubly stupid. Anyway so there I was in foster care when my mum came along and adopted me. For me this meant lots of cuddles and love but unfortunately also going on a diet. I rather love my food and being in care meant there was less control over my food which is not good for my health. Us cats also get similar health issues to humans due to podginess, for example diabetes and heart problems, so it is important that we watch out weights too. Whilst the diet side of things did not fill me with joy I did have another health issue that had been bugging me – ear mites (excuse the pun). In foster care this had not been spotted but my new mum soon noticed my constant ear scratching and she was concerned. She took me to the vet where we were told I had ear mites (I should add the vet also commented on what a lovely, remarkably well behaved boy I was). Had this not been spotted and treated it would have continued to be really unpleasant for me but also would have potentially led to my going deaf. Receiving the appropriate veterinary care is therefore really important for any animal and I was lucky that having been adopted I received this care. The sad fact though is that many of the animals in shelters in Romania and on the streets too have no access to even basic veterinary care and as a result are suffering everyday. Hope for Romanian Strays provides funding for basic care and vaccinations for strays both in shelters but also animals found injured on the streets. One programme in particular that was launched in August is to try to vaccinate puppies in shelters. Most of the puppies in shelters die due to disease and unfortunately many are too weak and ill to survive the vaccination process – but some do and this then provides them with hope for the future. 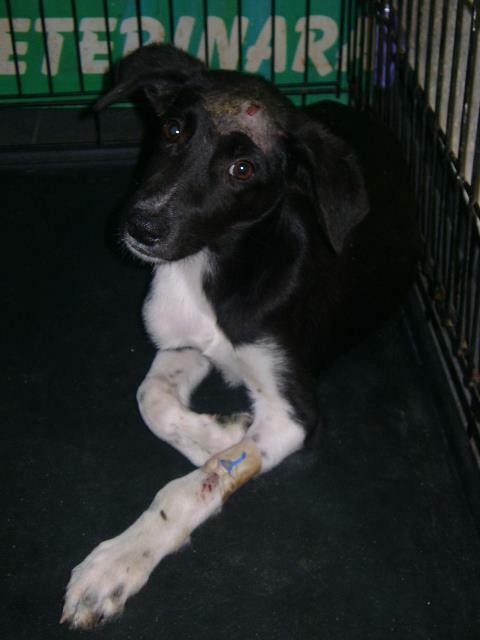 There are now plenty of happy stories as a result of funded veterinary intervention including Lily, the puppy who was found badly injured on the streets, who my mum helped bring to Switzerland to her new forever home where she is now a very happy, healthy girl. There is also my soon to be baby sister Baby who would not have survived without veterinary support. Many people are not able to offer a forever home but it is still possible to provide much needed support and sponsorship to help treat more cats and dogs. The suffering these animals go through on the streets is heartbreaking but good people are out there on the streets providing help, love and veterinary care – please help them to continue to help and to do even more. 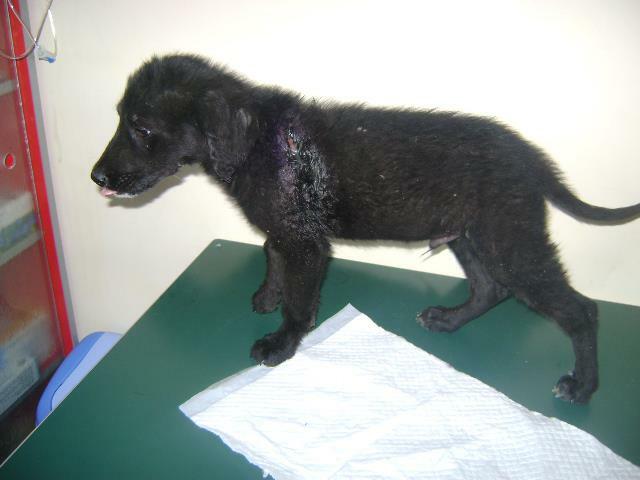 Here is the latest puppy in need of medical attention – Ricky who has a nasty wound on his leg and is now in foster care and will need funding for medical care. Thank you and glad you liked it. Those ear mites really were horrid – nearly as bad as my diet food! MOL!